Media blasting, also known as sandblasting, has grown as a reliable opportunity for revenue in the automotive market. Sandblasting equipment can be used to remove paint, rust, body filler, or coating from cars in no time at all. When it comes to cleaning and restoration jobs that are too tough for detergents and elbow grease alone, Best Buy Auto Equipment can help. We offer an assortment of sand blasters made by one of the best brands in the industry. Cyclone Manufacturing provides a complete line of abrasive blast cabinets for industrial applications within the automotive market. We supply Cyclone sand blasters at every price point, so you can find a budget-friendly solution that allows you to expand your service offering. Our selection of Cyclone Manufacturing sand blasters includes high-quality equipment that won't hit your bottom line. FT-6035 cabinets, for example, provide ample space, flexible glove ports, and other great features that enable you and your staff to be more efficient. Simply flip open the lid, place your part, and get to work! 3624 bead blasters epitomize the power, stability, and reliable technology that Cyclone sand blasters are known for. 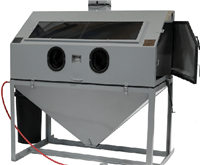 Siphon-fed blasters such as these come with dust collection systems that remove waste from the sandblast cabinet while in use and provide clearer visibility of the work area. Each large abrasive-blasting cabinet is constructed from 16-gauge welded steel to ensure longevity and prevent leakage. Surface preparation is a vital component of automotive service and repair. Set your shop up for success by browsing our collection of Cyclone Manufacturing sand blasters today. Looking for big blaster power in a small footprint? Look no further than our assortment of benchtop abrasive blast cabinets. BT-20 models deliver big on quality without taking up too much space in your workstation. We also offer interest-free financing for up to six months on select models. You can submit your business credit application today without any obligation to buy. You can also register an account to review orders, manage addresses, print invoices, and create wish lists with ease. Please contact us with any questions.